Red arrows indicate the destination of each type of Goods. Yellow labels beside the town names describe what they produce, the buy/sell prices, profit in gold, and profit in percent. Prices change continually, with and without your influence. Adjust accordingly. 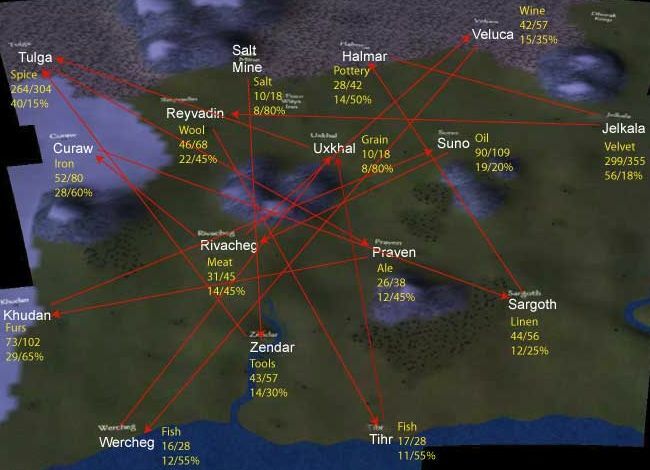 While regions' supply specialties will not change (Ichamur is always going to be the cheapest place for Salt), the demand characteristics are more fickle (Wercheg may start with the highest price for wine, but that it is unlikely to remain that way throughout the game). Horses can't be traded, but are invaluable to a merchant. The more horses you carry the faster your world map speed is (up to a certain limit, naturally). On the world map, all horses are equal. It doesn't matter if they're lame or spirited, saddle or hunter, all increase movement speed by the same amount. If you're buying horses solely to carry your gear just go with the cheapest ones, and don't just slaughter the lame ones for their meat. Running trade routes to farm gold is boring, but piles of denars can be made just by checking the goods merchant every time you stop by a town to sell looted weapons and offload prisoners. But how do you know when to buy? Here is a list of the base costs I lifted from 'item_kinds1.txt' . A good rule of thumb, if you find a good at half the base cost, buy it. You should be able to unload it at the next town for at least a little profit. Try to stick to goods with base value>100 if you are buying more than a few. Giving your character 1 or more in Inventory Management is a must. This gives you a good amount of storage space. Having a merchant background is probably the easiest for being an effective merchant. The first major barrier is your small wallet. If you sell everything you have (including armor and weapons) except your horse you'll have a good bit of cash to work with. Alternately, you could take part in a tournament to get the money you need. Either way, buy the cheapest horse available as soon as you can. During the early stages of building your mercantile empire you want to focus on the cheapest products with the highest profit margin: Salt, Wheat, and Smoked Fish are perfect for this. Also, don't forget to check the villages. They produce only very small amounts of goods (usually the same as the closest city), but will sell them at very low prices. Villages often even have surprising bargains in areas you wouldn't expect: sometimes Tools sell for as little as 250 dinars and beef for as low as 10 dinars. Remember that you can slaughter cows and turn each of them into two beef - this is an excellent way to turn a quick buck as cows are often cheap and beef always commands a respectable price in the cities. Visiting all of them may get tedious later on, but with the limited cash you start with, you can only afford a few goods at a time anyway. Since you're not in any state for combat you should run from any enemies. Be especially careful of mounted enemies, as they are sometimes fast enough to catch you. Visit the armourer of every town you pass through looking for Padded Cloth (any quality); it spawns randomly for each new game, but once you've found somewhere to get it from that place will consistently sell it. Keep track of what place that is when you find it, as you'll be needing this later. Any time you have about 200 gold spare buy extra horses, the cheapest you can find. Lame ones are useful because they are cheap now, but become useful as combat horses once they heal. Try to have at least 1 horse per 5 goods. This will serve to increase your speed, meaning you can venture further afield to carry more exotic goods more effectively while also being more able to escape enemies. Once you have two or more horses and about 200 gold you should start touring the taverns of Calradia and search for companions skilled in Trade and Path-finding. Give them a horse each (which optimises your map speed) and set off on your adventures. Bear in mind that their skills will stop working if their health falls to 30% or lower, so you may wish to keep them out of combat as much as possible. If you keep this up you'll become progressively richer, eventually to the point where you can buy out a merchant's entire stock (as long as you have enough points in Inventory Management). Now you can venture further afield more effectively. Keep buying horses with your excess cash. They will optimise your map speed, allowing you to add in the missing towns to your route. Increasing your Path-finding skill will boost your map speed even further. An alternate strategy for trade routing is to simply visit every town and village along your path. Instead of travelling Wercheg->Uxhal->Tulga->Wercheg, instead travel Wercheg-> Rivacheg->Reyvadin->Khudan->Curaw->etc. (while stopping at convenient villages along the way). With this strategy, the focus is on buying the goods at the cheapest prices and then holding onto them until you reach a city where prices are higher. In the above example, you could buy really cheap fish in Wercheg and then travel all the way to Uxhal to sell it and buy wheat, or you could stop at Rivacheg and pick-up cheap Wool, and then stop at Reyvadin and pick-up cheap dried meat, and then stop at Khudan and sell a little bit of your wool and pick-up some furs, and then stop at Curaw and sell more wool and sell a little dried meat and buy some iron, and so on. This way you don't waste time traipsing all across the map in order to make your trades and can make a lot more trades in a much shorter time-frame (and thus more money). Furthermore, because this game takes place in the medieval ages finance systems are not well-developed, so merchants can actually run out of money. If you sell too much to a merchant without buying anything 1) the price will drop really quickly, and 2) the merchant won't be able to afford to buy anymore. This is why a rolling trade route makes sense- you are buying and selling at every stop instead of having a start- and an end-point. Also this route makes it much easier to find your companions, tournaments, and book merchants since your hit the cities so much more frequently. The major caveats are that this strategy can slow down your map speed if you don't have very many horses (because your inventory will be very full), it may require lots of inventory management, and it is tricky to acquire such an inventory when dinars are dear. This page was last edited on 29 September 2013, at 00:33. This page has been accessed 112,579 times.